"I find the text and picture hilarious, especially since I will probably die of burpees this weekend at Spartan. The fabric of the shirt is super soft and the quality is excellent!" "Bought it as an interminable team in-joke but it was so very happy when it arrived - nicer fit than I expected and who doesn’t love a good Oregon Trail joke :)"
"I love being able to wear a message straight from my soul! Great material and fit. " "I wore these today for the first time, and the color alone brought me great joy! These shorts are amazing!" "The tank is awesome! The fit is perfect and the material is fantastic." "Great fit and the slogan on the front got a lot of laughs from my friends. Definitely a new favorite. " "These are one of my FAVORITE pairs of leggings! The print is the best, they fit perfect, they dont roll down, and they are totally squat proof! Perfect!" "Best leggings ever! They are so soft, comfortable, and look amazing!! I WILL be buying more from this awesome company!" 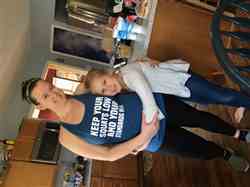 "I love this tank and NOBODY else has it around it!!! " "Timely service, comfy tank :)"
"This tank fits great &amp; came in perfect time to go with the badass set!! The saying is cute too lol"
"This bra fits amazing and keeps the girls in place!! I want all of them!!! " "I love the fit of these!! Can't wait to start adding color!! " "I love the strappy look. I get lots of compliments. " "I love how this tank looks and feels. " "I absolutely love the style & fit of these tanks!!" "Can you say AWESOME?! I normally wear a size 2-4 and I ordered a Small. Fit is snug but I think it's suppose to be that way and hold everything in. If you don’t want that super snug hold everything in feel then I recommending sizing up." "Feel amazing, fit fantastic and receive many compliments! Love this tank! " "Pleasantly surprised by the quality and durability of these. No wear and tear from my thunder thighs yet, it’s a definite win for me! Can’t wait to order more. " "This company is fantastic!! Not only do the leggings feel like a second pair of skin but the shirts are to die for as well. The have so many hilarious sayings that you won’t want to wait to go to the gym and show them off. Don’t waste your money on any other brand. CVG is where it’s at!" "This sports bra is fabulous!! It holds great when your doing high impact workouts. Def recommend!!!" "Love the tanks and sassy sayings"
"LOVE HOW THESE FEEL, PERFECT FIT THEY DO FALL A LITTLE BUT OTHERWISE LOVE THEM!!!" "I have done crossfit in them twice, received compliments on my cute leggings and they stayed put with squatting and running, and not see through. Love them!" This shirt is so fun!!! "I love this shirt and it is so much fun. I get lots of compliments. " "The design and colours are one of a kind, and so comfortable!"